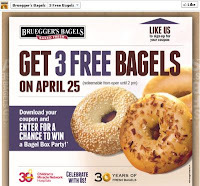 Get 3 free Bagels on April 25th, 2013. Also enter to win a Bagel Box Party. Click the link below to go to the Bruegger's Bagels website to get your coupon. "Like" Bruegger's Bagels to get the coupon. Print your coupon & take it to your nearest location to redeem.